So, we have a lot to cover this morning with all kinds of wonderful new spoilers. First of all, please watch the Born of the Gods trailer. Then we'll get down to business. I'll wait. I'll be here when you get back, I promise. Seriously, go watch the trailer. Something catch your eye? They are all allied colored. Where is Red/Green you ask? Why, that's Xenagos, the narrator of the trailer. It was accidentally spoiled before Theros was released that Xenagos would ascend to be a god, and in this set he becomes a god as seen during the end of the trailer. So, you could say he's the villain of the block. So, how will these two-color gods work? Surely they won't need 5 devotion of each color, right? Well, that's correct. It looks like they will be 7 combined of both. Let's check out Ephara. So, if a creature comes under your control during your previous turn (other than Ephara), you get to draw a card at the beginning of your upkeep. 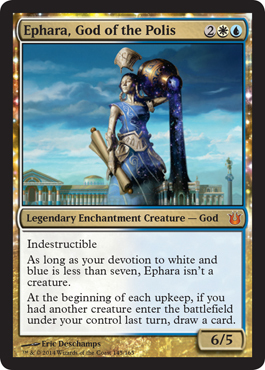 Not bad, not bad... And just like the Theros gods, Ephara is indestructible, as all gods are in this block. Inspired is a keyword that triggers when the creature it is found on untaps, which could be during upkeeps, or it could even be when you have a card (such as an instant) that can untap it. 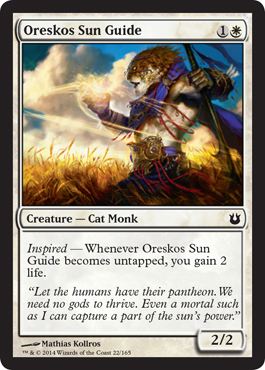 This example, Oreskos Sun Guide, gives two life each time it untaps. This is yet another Inspired keyword card, and it is essentially Dark Confidant, with one more point of toughness, and this triggers before your upkeep step (Untap, Upkeep, Draw), and this is a rare, versus the mythic rare of Dark Confidant as released in Modern Masters. Look at that price, and consider this card. This could be a very valuable card. 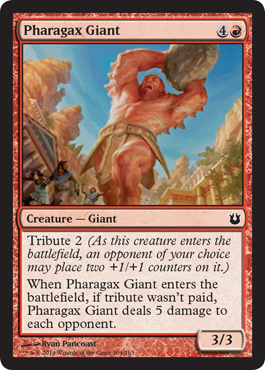 And now for our other new keyword, Tribute. Wizards has told us about the Archetype 5-card cycle of uncommon enchantment creatures. It appears they have two global effects and have no bestow cost (which, there are still bestow cards in Born of the Gods). 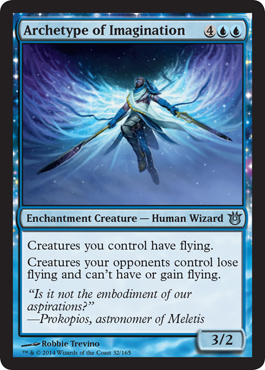 With the example of this one, your creatures all get flying and creatures controlled by your opponents lose flying and can never get it back unless this enchantment creature isn't on the field. Nifty, huh? Kiora, a fan favorite after Duels of the Planeswalkers 2012, is a merfolk planeswalker originally from the plane of Zendikar. She prevents damage dealt to and by a permanent (planeswalkers, land, etc. included), she gives you the option to draw a card and play an additional land, and if you make it to her ultimate, then you get an emblem that gives you a 9/9 blue Kraken token at the end of your turn. Pretty sweet, but how good will she really be in Standard? Planeswalkers typically are pure awesomeness in a limited capacity, but hey, maybe she'll make a giant splash in Standard. For more spoiled cards, be sure to check out our spoiler page every day.